I think back to the last time I slapped a driver, and their reaction, and decide not to do that. We all crane our heads up at the sky and see the constellations that are usually lost to us. It’s at this point a big green light coasts down across the sky to our right. We all saw that one. Whatever. I ALWAYS miss this sort of thing, so I’m well pleased. Once we reach our trucker’s motel in Norseman, I have a good old Google. 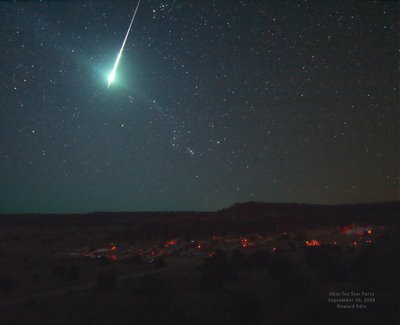 Tons of streaky green UFOs have been seen above Texas and New Mexico since the 1940s too, as is their wont. They’re as regular as buses above Los Alamos, where the US military are constantly forced to insist they are natural phenomena. But such phenomena also happen loads in this neck of the woods. 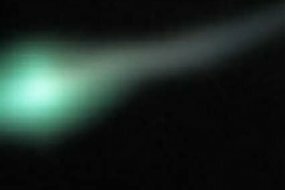 In 2006 at least three phosphorescent green fireballs trailed over northeast Australia and rolled down the side of a mountain. They were explained away as meteors, the shockwaves of which lead to electrically charged oxygen similar to that seen in auroras. Keeper? Need to see another one – I forgot to make a wish.